I don’t know about you but I am having major withdrawal symptoms now the Olympics are over. I have been glued to the TV and thanks to our amazing athletes, I have felt proud and honoured to be British. 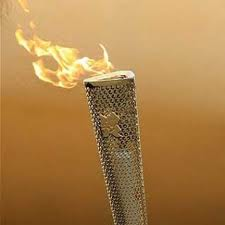 A few months ago I received an email telling me I had been nominated to be an Olympic Torchbearer. Just a few weeks later, I was told that I had been selected to be one of the lucky eight thousand who would carry the torch across the country. I was beyond chuffed and surprised! As the date of my torch bearing duties approached, I wasn’t really looking forward to it — I had been left bedbound with exhaustion and was receiving radiotherapy for some tumours that had taken residence on the side of my neck. I had lost a lot of weight, was struggling to get out of bed, suffered terribly with anxiety (something I have never experienced before but managed to overcome with some EFT techniques I had picked up over the years) and ended up in hospital having three litres of fluid drained from my pleural cavity. I could barely get out of bed and I honestly had no idea whether I was going to be able to actually make it to carry the torch. However with some TLC from my loved ones, lots of good food, sleep and a determination to build up my withered little chicken legs, I made it. In preparation, I took small walks from one end of the garden to the other. My mum even made me a makeshift torch from an umbrella with a candle attached to the end! She encouraged me to practice the 300 metres I would be walking in front of hundreds of supporters that turned out to support myself and twenty other torchbearers. Thankfully on the day in question I was feeling strong and managed the walk successfully with thirty of my friends and family cheering me on from the sidelines. It was a beautifully sunny day and we celebrated in style with a fabulous picnic in a park afterwards. I even got to keep my torch — double bonus! In challenging times, it can be difficult to keep the flame of positivity and determination alight but I want you to know that you can overcome anything you put your mind to. It’s more than just positivity. It’s a knowing that everything will work out okay and that your spirit is stronger than you will probably ever know.